360Rize VR Software is proud to announce the release of our 360CamMan V2 software. This is the latest version of our virtual reality 360 video file management software. 360Camman V2 is now available for PC and MAC! 360CamMan Version 2 works directly with user’s micro SD cards. Users can transfer, organize and store SD Card files effortlessly on their computer. 360CamMan’s SD card formatting feature arranges this organization. Formatting feature renames each card. SD Card files are stored effortlessly in a manner allowing the software to instantly recognize which camera’s files the card contains. When paired with multi-port USB 3 hubs and readers, 360CamMan V2 supports simultaneous data transfer. For instance, if I am filming with the H3Pro6, I am using six cameras and six micro SD cards. By formatting these SD cards with 360CamMan pre-shoot, each card will be named based on the “Head” (in this case the Pro6) and camera number. Formatting can either be accomplished one card at a time or simultaneously with a multi-card USB3 reader. Lets continue to talk about our H3Pro6 project example. The SD card for camera one will be formatted and renamed “360-H01-C01” (Holder 1, Camera SD card 1). The SD card for camera 2 will be renamed “360-H01-C02” (signifying Holder 1, Camera SD card 2). With the cards formatted with this naming, 360CamMan will recognize each card when they are reinserted for the data ingestion process post-shoot. 360CamMan V2’s new multi-port USB3 hub compatibility allows users to transfer data from up to 13 cards simultaneously. During the file transfer process, 360CamMan will recognize and ingest the data from each of the formatted SD cards. Thanks to this new multi-port USB3 compatibility, this data can be transferred at rates as high as 90 MB per second. Furthermore retaining the previously mentioned organizational naming convention to keep files from each SD card (camera) in order. Multi-port USB3 support optimizes workflow when transferring data. However, transferring one card at a time is still supported as with the previous version of the software. The next step in the ingestion process is using 360CamMan V2’s new built-in Video Analyzer. This is a tool which creates a detailed report of the user’s uploaded video data. The analyzer indicates whether the proper camera settings were utilized to allow for a successful 360 video stitch. Users can review the displayed length, frame rate and aspect ratio of every uploaded take in a table. In the current example, each take’s frame rate, aspect ratio, and frame size match. The analyzer indicates that the user utilized the proper GoPro settings for each camera. Proper settings this case are 1440 x 1920. If this were not the case, the Video Analyzer highlights incorrect camera settings. Correct stitch is interrupted by data highlighted in orange and red. The Video Analyzer also allows users to view the order and frame count of every take that is ingested. With this view, takes that are in the incorrect order can be moved to the proper location in the take sequence. 360CamMan creates a folder containing the same take number from each camera during setup. For example, folder “Take01” will contain the first take from every camera while folder “Take02” will contain each camera’s second take. Users then have take folders stored locally on their computer. Users can then drag takes and dropped them into a stitching software program. Panoramic photographers will enjoy 360CamMan’s new photo file management tools which allow for the simple ingestion and organization of large numbers of panoramic image files prior to the batch stitching process. By converting GoPro image sequences into 360CamMan files, or files named based on their image sequence and camera number, ‘CamMan is able to create a single folder containing readable files for the batch stitching process. For example, the file name “S001-C01-TimeLapseTest-GoPro0001.jpeg” signifies that this file is the image captured by camera 1 for this first sequence. The software follows this pattern for each of the images from sequence 1 (the first panorama) and again for sequence 2. After sequentially naming and organizing the files, the Manage Time Lapse Photos feature allows you to ensure that each sequence has the proper number of images. For instance, each sequence captured with a 6-camera rig will have 6 images while each sequence for a 10-camera rig will contain 10 images. 360Camman moves or delete images that are out of sequence. Users can add missing photos to maintain the integrity of the entire time lapse and each panoramic image sequence. The 3D Side-by-Side tool builds stereographic .mp4 files that are ready for virtual reality HMDs. In creating 3D stereographic spherical video content, the workflow requires content creators to stitch two separate spherical video files. One captured by the “left eye” cameras, and one captured by the “right eye” cameras. Users then overlay these files into one 3D file. Formerly users accomplished this challenging process in a separate editing software (usually Adobe Premiere) and required hours of painstaking adjustments. 360CamMan V2’s 3D Side-by-Side formatting tool now enables users to accomplish this task in seconds. The first step is to simply drag and drop both the “left eye” and “right eye” spherical video files into the designated fields under the “Build 3D Side-by-Side” Tab. After importing these files users can simply select a destination folder and click “Build 3D Side-by-Side Video in Equirectangular Format” to output a VR-HMD ready file. With this side-by-side orientation, files produced with this tool are fully compatible with virtual reality HMDs such as the Oculus Rift and Samsung Gear VR. 360CamMan’s new file merging video conversion tool allows users to automatically combine these takes into single video files. This greatly reduces the users number of take files when transferring data into a stitching software program. Every virtual reality HMD’s display technology is different. Headsets require unique file specs for the best results.. This can be challenging for producers who wish to display a single file across multiple devices. 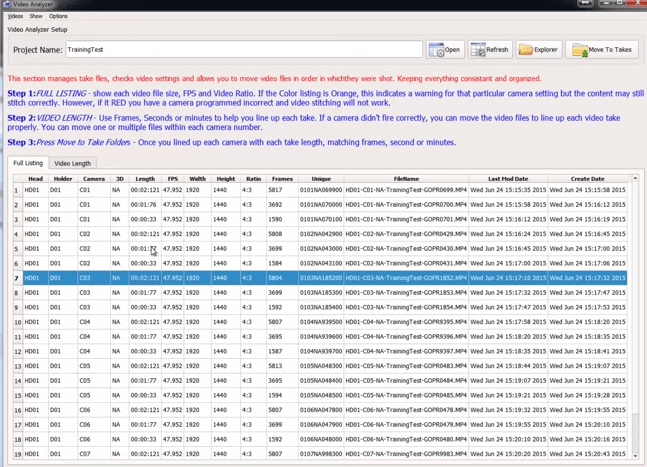 The Video File Optimizer makes it possible to import a single original .mp4 file. After import, the file can convert multiple times to the best specs for each environment. For example, take a user who wishes to create a file optimized for the Gear VR . Furthermore the user also wants the same file for web playback. The user can simply import their original .mp4 file twice. 360CamMan will produce two new files with the proper resolution and bit rate for each playback scenario.